MTN is not through with their festive season surprises to their customers yet, and I know it as I know my name that something more is still cooking. Sometimes last week, they dish out 6,000min airtime to 60% of their customers and only those who has partner where able to use it successfully. 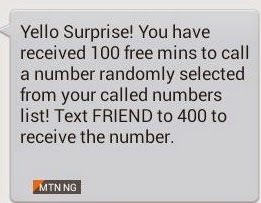 Just this evening again, I got a message from Mtn “Yello Surprise! You have received 100 free minutes to call a number randomly selected from your called numbers list…! I was like ah… what kind of surprise is this, after all I wasn’t eligible for the free 6,000 min they gave last week. How Do I know if I’m Eligible For This Offer? Just wait for the message perhaps they are actually randomly selecting those numbers. Or better still, text FRIEND to 400 then wait for their reply. The question now is are you eligible or MTN is simply not sure if you have a genuine friend or not? I was so interested to be among the braka awup bonanza,up up MTN NETWORK.